12,788 Smart chess players' stats live here! RATINGS IMPORTANT: See NOTES below. Except for "Unofficial Rating", the statistics above are official, reflecting activity which occurred at least 2 weeks ago. Activity occurring within the past 2 weeks is excluded, as it is still subject to correction and, therefore, is not yet considered "official". Most of the statistics are not available to provisionally-rated players, and will only appear in this Profile once the player has achieved a Rated Status of "Rating Established". Thus, Highest Rating Achieved, for example, represents the player's highest rating attained once the player has achieved Rated Status -- provisional results are disregarded. While both Unofficial Rating and Official Rating take into account all results, White Rating is calculated based exclusively on games in which the player had the White pieces; Black Rating, where the player played Black. The Uphill Rating is based only upon the player's games where the opponent was at least 150 points stronger than the player; Downhill Rating, where the opponent was at least 150 points weaker. The Regulation Rating reflects results only from timed games where each player had a minimum of 45 minutes thinking time (time control of "game/45" or longer). The Quick Rating is based on games with a time control between game/15 and game/44. The Speed Rating includes only games from game/7 to game/14. Results from game/6 or faster ("Blitz") are ignored for rating purposes. Untimed Rating reflects games where no clock was used. Since these "specialty" ratings are based upon a subset of the player's games, they do not behave the same as the player's Official Rating. For example, if the player wins 6 games in a row -- 3 with white and 3 with black -- the Official Rating might rise, say, 120 points; yet the player's White Rating and Black Rating may rise only about 60 points apiece. Remember that the "specialty" ratings are not meant to track overall performance, but should be used only to look at a particular dimension of play. The White and Black ratings, for example, should be viewed together to determine whether the player has an imbalance -- a weakness playing defense, for example. The Uphill and Downhill ratings should make the player aware of a different dimension of play; is the player intimidated by stronger players? Or inspired by the challenge to play better? Is the player overconfident against weaker players, ending up losing net points in those games? The main point here, is that the "specialty" ratings are for measuring very specific dimensions of play -- not overall performance. 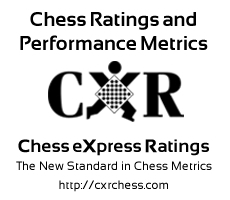 Copyright © Chess Express Ratings, Inc.